For their upcoming match, British football team Plymouth Argyle isn't making any sponsorship cold calls, emails or pitches. They're hoping eBay will bring sponsors to them. 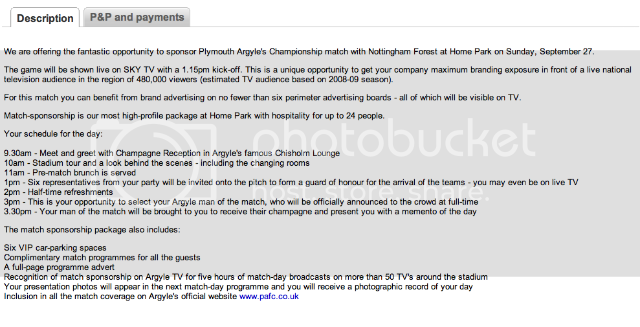 Plymouth Argyle recently took out a listing and is looking for a sponsor for their upcoming Championship match, which will get branding exposure in front of a live national television audience in the region of 480,000 viewers (estimated TV audience based on 2008-09 season) on SKY TV. Last month we covered the way some sponsors, like Continental Airlines, are using auction style markets to distribute assets they receive through sponsorship to their consumers. In addition to six perimeter advertising boards, the ebay listing states that a sponsor will receive hospitality for up to 24 sponsor VIP's. Especially given the BMA's recently proposed restrictions on sponsorship, it is a bit curious that they didn't list any restrictions to the sponsor category. Under eBay's rules they would be contractually obligated to deliver the benefits proposed to whoever the highest bidder is. An adult publication, tobacco company, alcohol, etc. This would not fly with a lot of properties. How are they doing? With 7 days to go, there are three bids with the top one coming in at £1,650, certainly not enough to cover the costs of the sponsorship inventory. Still plenty of time though. That's the beauty of an efficient market with competitive bidding - the last bid is the only one that matters. So is Ebay the new way? Probably not, but we're definitely interested to see how this plays out. What's your take? 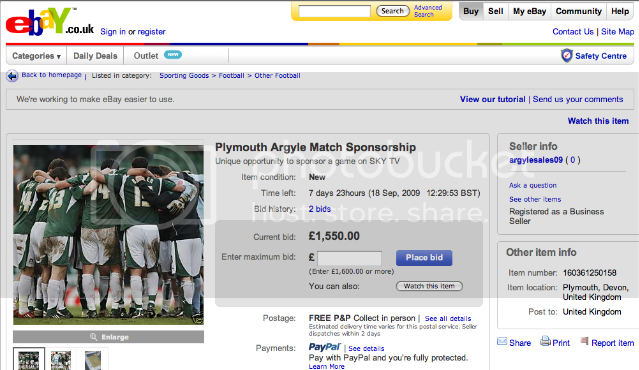 Could eBay style auctions work for sponsorship? Hats off to Ashley Read for providing us with the lead on this. UPDATE: In comments, Nick mentions raffling sponsorships as another new idea being hatched. Rugby team, the Wakefield Wildcats, recently raffled off naming rights to their new stadium at half-time to one of 50 participating local companies. Read the full story.